“Home” means different things to different people, but whether it’s a place, a time, or a memory, it’s usually defined by a sense of warmth, welcome and comfort. From safe shelter and daycares for children and youth in Bolivia, to home-based care that provides encouragement and connection for those isolated because of HIV/AIDS in Uganda, to self-help groups where women train and work together in Ghana and Ethiopia … home is most often about connection to people as much as a roof over our heads. But for so many CFTC beneficiaries, it starts with a roof over their heads. Alalay (“I am cold” in the local Aymara native language) serves some of the 800,000 youth who live and work on the streets of La Paz and other urban centres in Bolivia, where winds sweeping up from Argentina and the high Andes altitude create a climate that makes life on the streets a harsh place. The children who find shelter at an Alalay village form deep bonds of friendship that are as vital to their recovery as the food, clothes, counselling and education they receive thanks to the generosity of Canadians who support these programs through Canadian Feed The Children. 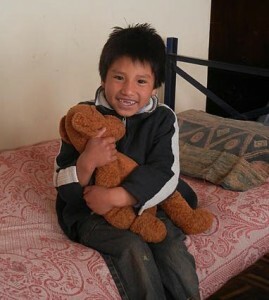 Once children land at an Alalay shelter, even if it’s just for a few hours at a drop-in centre in busy La Paz, they experience their first sense that there’s a place of warmth, solace and support available to them. For these children, some as young as two, Alalay becomes home – where the healing begins. 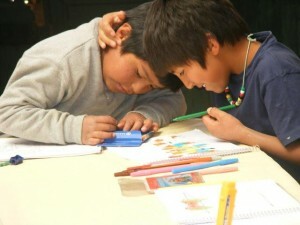 CFTC donors also fund daycares and early childhood education centres in Bolivia, which offer thousands of children a “home away from home”: a safe place to learn and grow during the day, freeing up their parents to earn an income and their older brothers and sisters – who would otherwise be kept at home to care for younger siblings – to go to school. For Jane Nabwire it also started with safe shelter. Jane and her 13 children and grandchildren had been living in a one-room hut with no water or sanitation, little furniture and no means of earning an income in rural eastern Uganda. 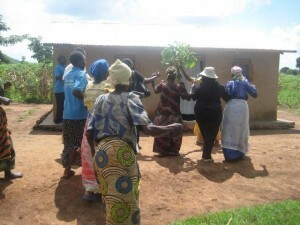 With the support of CFTC donors through UCOBAC (the Uganda Community-Based Association for Child Welfare), the first thing volunteers did was to upgrade Jane’s home to a sturdy, sanitary sheet-metal and cement structure. From there, Jane’s indomitable spirit took flight. With the ongoing support of UCOBAC’s community-based volunteers – whose job is as much to ease the isolation experienced by HIV/AIDS-affected families as anything else – Jane started several home-based businesses which flourished. Her grandchildren are healthy and attending school. Her oldest son now runs the brickworks business they started together. And, she leads a women’s group in her village to identify and inspire those who, like her, just need a neighbour’s helping hand to get back on their feet. Where she was once living in fear and isolation, Jane and her family are now safe and secure in their own home, in their community. For Jane, home is where the hope is. 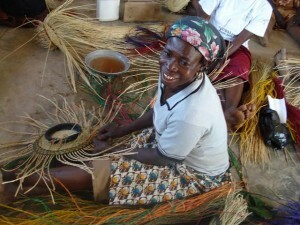 Creating beautiful baskets at the Zaare Craft Centre in Northern Ghana. For the Ghanaian basketweavers of northern Ghana, the new roof over their heads puts food on their tables and sends their children to school. The Zaare Craft Centre just outside Tamale in Ghana’s impoverished Northern Region serves as home base for these women to safely store their supplies, receive training, create their products, and network to grow their business. And grow it they have: CFTC’s partner TradeAID Integrated has empowered the women basketweavers of Northern Ghana to carve out an international market for their beautiful baskets, carrying themselves and their families out of poverty. Their home may be ‘built of straw,’ but it’s also built to last!